Investigate Industries and Internships (i3) is designed for undergraduate students who are exploring various career options, eager to hear professional journeys, and looking for internship opportunities to help determine what path to take. 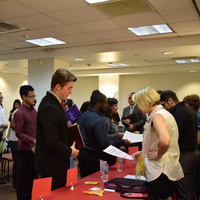 At an i3 event, you can learn how employers broke into their respective industries, hear about what it is actually like to work in the field, and network with them to let them know what makes you a great intern. All participating employers offer paid internships for fall, spring, or summer semesters, so this is your chance to learn more about their company and make a great impression. View the complete event details here.